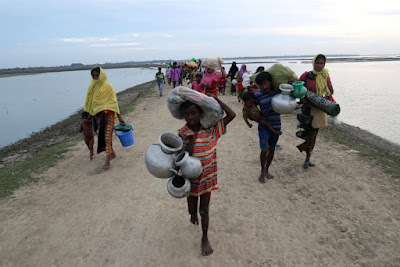 DHAKA -- A senior United Nations official said on Sunday she would raise the issue of persecution of Myanmar’s Rohingya minority, especially sexual violence and torture, with the International Criminal Court (ICC). Pramila Patten, Special Representative of the Secretary- General on Sexual Violence in Conflict, also said around $10 million is needed immediately to deliver specialist services for survivors of gender-based violence. Patten was speaking in the Bangladeshi capital after a three-day visit to the Cox’s Bazar region, near the border with Myanmar. There she met women and girls who are among hundreds of thousands of Rohingya that have sought refuge in Bangladesh following a crackdown by Myanmar’s military on the predominantly Muslim minority. “When I return to New York I will brief and raise the issue with the prosecutor and president of the ICC whether they (Myanmar’s military) can be held responsible for these atrocities,” Patten said after visiting several camps. She said she would brief the U.N. secretary-general on the situation in Cox’s Bazar and that her office’s annual report, to be presented to the Security Council in March, would include a dedicated section on Myanmar. “The widespread threat and use of sexual violence was a driver and ‘push factor’ for forced displacement on a massive scale, and a calculated tool of terror aimed at the extermination and removal of the Rohingya as a group,” she said. Patten said that since the first mass influx of refugees into Bangladesh in August, gender-based violence specialists had delivered services to 1,644 survivors of sexual and gender-based violence, “although this is only the tip of the iceberg”. “We need full funding for this humanitarian crisis from the international donor community. The burden is too heavy to be borne by the government of Bangladesh alone,” she added, calling for about $10 million of international funding. Patten said she had been denied access to Myanmar itself. Myanmar warned on Wednesday that a scolding delivered by the U.N. Security Council could “seriously harm” its talks with Bangladesh over repatriating more than 600,000 Rohingya who have fled Myanmar’s Rakhine state since Aug. 25. The United Nations has denounced the violence during the past 10 weeks as a classic example of ethnic cleansing to drive the Rohingya Muslims out of Buddhist majority Myanmar, an accusation Myanmar rejects.